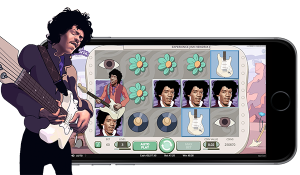 Jimi Hendrix Slot - Join the legendary guitarr player in this NetEnt creation! Are you a fan of Jimi Hendrix? Chances are, if you know anything about music at all; then you know exactly who Jimi Hendrix is. This is a person that has forever revolutionized the world of guitar play, and is cherished as one of the guitar gods of history. Well lo and behold, there’s now a way in which you can unite your passion for Jimi Hendrix’s music; and your passion for the slot games. You can do this on the Jimi Hendrix slot game that’s available for play. This game was created by the world-renowned online gambling games designing company called NetEnt. You may have heard of them as the best designers of slot games in the world. Well now their team has created a game about Jimi Hendrix; and the entire setting of the game is a bit psychedelic. When you first play this game, you will be able to see an intro where Jimi Hendrix plays his music, and then the entire scene becomes engulfed in psychedelic feel. It’s an excellent introduction to the game – and right at the outset you will be able to see whether you will like the game; according to your reaction to the initial introductory video. If you find that you’re fascinated by the field of psychedelics, and by Jimi Hendrix’s music; then you will most likely like the graphics and music of this game. The symbols are in tone with the psychedelic atmosphere of the game. There’s the eye, the flower, the Mercedes Benz symbol, and the heart. But there are some traditional symbols as well – you will see that there are the cards from jacks to aces. And there are the high winning symbols such as Jimi Hendrix face. You can also get a wild symbol which can be used to replace any other symbol of the game except the scatter symbols. You can check the value of these symbols at the pay table. There are 20 pay lines at this game, and they are fixed. But there are also ways in which you can activate bonus features – you can get to them by striking 3 scatter symbols at any given free spin. And then you get access to a pick and click game where you will select your bonus. You can get the Crosstown Traffic free spins; the Purple Haze free spins, and the Little Wing free spins. They all differ as to the free spins bonus that they will award to you, so it’s nice if you could see them all in action. And if you get four or more red guitar symbols in any given spin, then you will trigger a respin. If you get additional red guitars, then you will get additional free spins. This feature ends when there are no new red guitars that you have been awarded with as a result of your spin. By all means, you ought to try this game and have fun with it. It doesn’t matter if you like Jimi Hendrix or not – you will still find a way to like this game.